Nearly 92% of economists surveyed this week by the Wall Street Journal expect that our eight-year experiment with unprecedented monetary easing from the Federal Reserve will come to an end at the next Federal Reserve meeting in December. 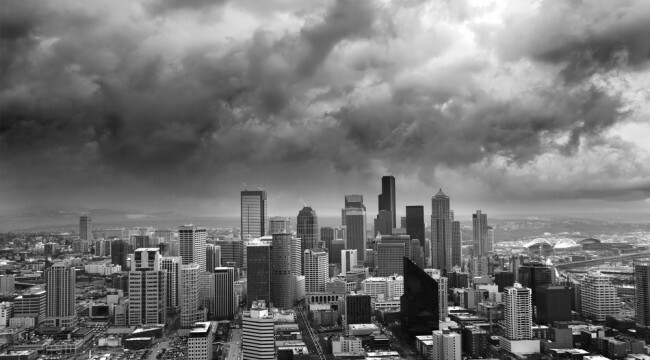 Since we have had the monetary wind at our back for so many years, at least a few have begun to question our ability to make economic and financial gains against actual headwinds. But in reality, the tightening cycle that the forecasters are waiting for actually started last year. Sadly, the markets and the economy are already showing an inability to handle it. Another big input is Fed “forward guidance.” This comes in the form of official and unofficial pronouncements from top Fed policy makers as to the possible trajectory of rates in the future. If the Fed communicates that rates will stay low, or QE will remain in place for some time, then policy becomes looser still. Such assurances effectively remove near term interest rate risk, which stimulates financial activity. Ever since the financial crisis of 2008, the Fed has engaged in unprecedented forward guidance, without which monetary conditions could have been expected to be tighter. But the Fed’s QE tapering campaign, which gradually reduced the amount of securities purchased monthly by the Fed, effectively began a campaign of monetary tightening that helped push up the shadow rate sharply even as the fed funds rate itself did not budge. After QE was officially wound down in October 2014, the Fed began to change its forward guidance to actively suggest that a long-term campaign to lift interest rates would begin in 2015. This also worked to help tighten monetary conditions. As a result, the shadow rate moved up from negative 2.99% in May of 2014 to just negative 0.74% in September of 2015, (FRB Atlanta, CQER, Shadow Rate) an increase of 225 basis points in just over a year. US stock investors may be complacent regarding the ability of the stock market to withstand higher interest rates. Their confidence may come from the fact that, historically, markets have not peaked until 12-24 months after the Fed begins to tighten. This assumes the tightening cycle begins with the first official rate hike. But if it really began with the increase in the shadow rate, then a December rate hike will already be 19 months into the tightening cycle! Plus, given how overvalued stocks may currently be and the amount of corporate debt accumulated to finance share buybacks, this bull market may be far more vulnerable than most to higher interest rates. The last three times the Fed had conducted a rate tightening cycle (1986-1989, 1994-2000 and 2004-2006), the increases in rates averaged 388 basis points. But those moves upward occurred when QE did not exist and when forward guidance was hardly a factor (the Fed only started doing press conferences in the last few years). So the tightening that has occurred to the shadow rate in the last year is already 58% of the size of the average of the last three tightening cycles. If the Fed does as it has suggested it will and takes fed funds up to 2.6% by the end of 2017 (which is the Fed’s own median forecast), then the total effective move (that includes the tightening of the shadow rate) would be a tightening of 559 basis points, well larger than the average of the last three tightening cycles. Does anyone really believe that our fragile and slowing economy can deal with that kind of headwind? Nevertheless, most people assume that rates are on the way up to 2% or more. But from my perspective, it’s much more likely that the rates never get close to that level. I would argue that any positive rate of interest would be enough to stop this economy cold. Years of negative rates have so corrupted our economy that I believe it is now fully addicted and cannot survive under any other condition. 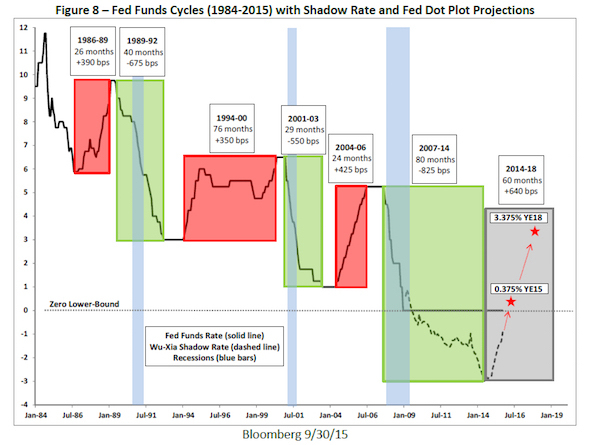 Each of the last three easing cycles took rates lower than where they were at the end of the prior easing cycle. 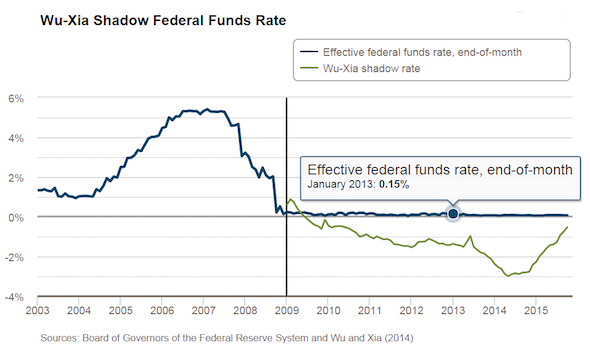 Given that the fed funds rate is at zero (and the shadow rate got to as low as negative 2.99%), one shudders to think how low the Fed is prepared to go the next time around. As a result, investors may want to consider re-positioning their assets for another period of possible monetary easing and not a period of tightening, which I believe, in fact, is already well underway and will soon be a thing of the past. December is far less significant than what almost everyone has been led to believe.